Fans of the Seattle Sounders, widely regarded as the most loyal in the MLS, gather at CenturyLink Field before a game in 2014. Photo: MOBILUS IN MOBILI/FLICKR. The first three names are the most commonly known for “the beautiful game”, originating from England, Spain and Germany, respectively. Of course these nations, along with most of Europe, Africa and South America, have been playing the game for centuries. Not only is it played, but the game of football has transformed itself from a game into a lifestyle. With the establishment of the World Cup in 1930, the game has become something of national pride, with nations from around the globe coming together in respect for the beautiful game. The last of these names, soccer, is predominantly used in America, and is one with much less historical value and importance, but that’s changing quickly. Soccer has been around in the States for quite a while. It dates back as early as 1850, with a strong emergence in the 1970s, when the New York Cosmos of the North American Soccer League signed Brazilian legend Pele in 1975. While Pele only stuck around for three years, American soccer has remained long after he. 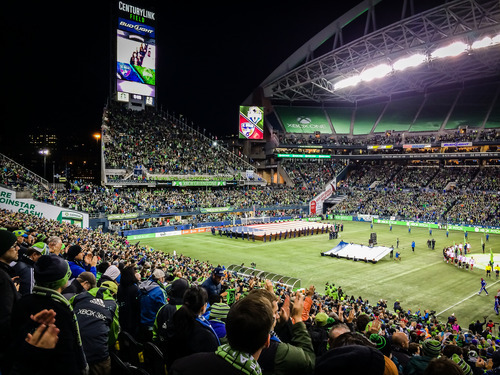 With soccer growing ever so slightly throughout the late 20th century, its catalyst came with the founding of the MLS (Major League Soccer) in 1993 and the United States hosting of the World Cup in 1994. While the Cup gathered a lot of international attention and pride for American soccer, the league left a lasting effect. However, with just 10 teams in 1993, the MLS suffered from weak attendance early on and a general distaste for the sport by Americans. It wasn’t until 2002, when the USA men’s national team made it all the way to the Quarterfinals of the World Cup that Americans began to realize the sense of pride and appreciation for the sport that other nations had felt for centuries. The 2002 World Cup marked a massive resurgence of popularity for the sport, with the emergence of American stars such as goalkeeper Tim Howard and forward Landon Donovan. Three years later, in 2005, the MLS expanded for the first time since 1998, adding Chivas USA and Real Salt Lake. It happened again two years after with expansion past US borders into Canada, with Toronto FC. While the league was expanding its number of teams and attendance, the largest boost for professional American men’s soccer came on the back of British superstar David Beckham, who joined the LA Galaxy in 2007 under the Designated Player Rule. A household name all around the globe, Beckham gathered massive attention for the league, increasing American approval for the game, as well as attendance. The league has continued to expand since then through teams such as Seattle Sounders FC, the Vancouver Whitecaps, the Philadelphia Union, Portland Timbers FC and, most recently, New York City FC and Orlando City Soccer Club (both to begin playing in 2015). While the MLS continues to expand, so does American appreciation and approval of the once ridiculed game. More and more, soccer is entering the lives and homes of families who once deemed it a foolish sport that was only played “over there” (Europe, everywhere else, etc). More people are encouraging their kids to play soccer over American football, and would rather watch the MLS instead of the MLB. While soccer may not be the biggest sport in the U.S. (third largest today, behind basketball and baseball), it is more and more rapidly becoming an American athletic superpower. Finally, Americans are joining the rest of the world to enjoy “the beautiful game”, whether it be called football, fútbol, fußall or soccer.